Kansas City, Mo. 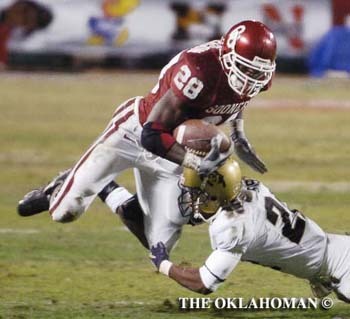 - With an admonishment from Oklahoma quarterback Jason White to "not go tip-toeing in there," running back Adrian Peterson slammed off right tackle, broke outside, met Colorado cornerback Terrence Wheatley around the 7-yard line and stiff-armed him all the way to the end zone. With that, the 19-year-old from Palestine, Texas, completed a 32-yard touchdown run and the most successful freshman season in NCAA history: 28 carries for 172 yards, three touchdowns and a record 11th 100-yard game. He finished the season with 1,843 yards, 1 yard behind California's J.J. Arrington. 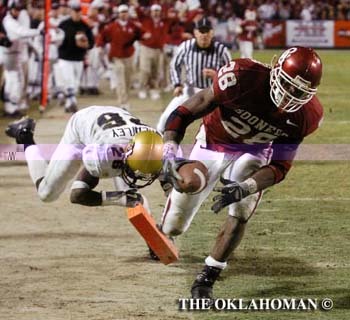 No wonder Wheatley was so impressed after the Buffs defense was rendered virtually helpless to stop the Sooners in the Big 12 championship game. "I've never seen a guy that runs that hard for a guy his age," Wheatley said. "He's so big and so strong and so fast. "I was running for my life to get him. I saw him take off, so I just tried to head him off, and I just kind of ran out of room, so I tried to shove him out of bounds, and I just couldn't do it. He gave me a stiff arm and just kind of pushed me along with him. That's how strong the guy is. He has great vision, too. He's really the complete package. For him to stop on a dime and come back across the field like, you just don't see that from a true freshman." 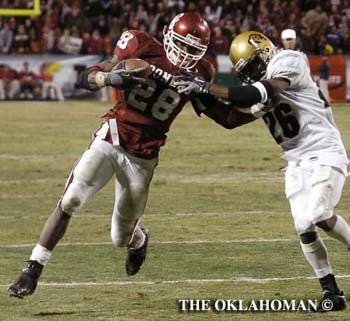 The Buffs got a good look right from the start as Oklahoma unleashed Peterson on the first two plays of the game, letting him rip off the left side for 24 yards on his first two carries to loosen up the Buffs defense. "We wanted to pound them and pound them and keep pounding them to open up the passing game," Peterson said. "I was just hitting the hole hard and trying to keep my feet moving, but toward the end I started getting tired, so on that last run, Jason told me not to be tip-toeing it in there." Wheatley apparently wasn't the only Buff who became a Peterson fan. "They were all telling me to keep working hard," Peterson said. Between the poundings, White was passing, completing 22-of-29 for 254 yards and three touchdowns in a performance that might have won him a second straight Heisman Trophy. As last year's winner, he gets a vote in this year's voting, and last week he said he'd voted for Peterson. Peterson said was the most flattering thing he'd heard all day, but that if he had it a vote, it would be for his quarterback. "He's our leader," Peterson said. "He's the one who's led us to the BCS championship game." Wheatley said if he had a vote, "I would probably vote for both of them. White was just amazing. I've never seen a guy be so on target with every pass. If you were a half step behind or even stumbled a little bit, it was going to be a completion. They're both great players." 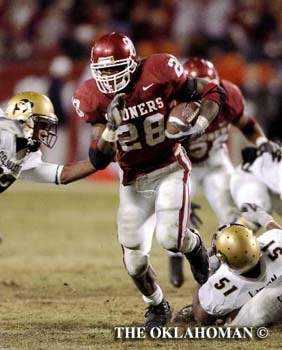 But it wasn't just the two Heisman Trophy candidates who were clicking, coach Bob Stoops said. He said this was the Sooners' most complete game of the season. "In our last three games, we've been very close, so we were on the verge of that. But until tonight we hadn't really clicked and put it all together."